Let's get Organised and a Fabulous Giveaway to keep you Fabulously Organised. | Life Love and Hiccups: Let's get Organised and a Fabulous Giveaway to keep you Fabulously Organised. Let's get Organised and a Fabulous Giveaway to keep you Fabulously Organised. "She's a Super Freak, Super Freak - Super Freakeyyyyyyyy owwwwwwww"
Sorry that was my really bad singing and the funny thing is I betcha you were singing along as you read it and now you will have that song in your head for the rest of the day ......sorry Bwhahahahaha! If I am sounding a little insane today it is because I totally am. By now we are all drowning in the back to school, back to sports, back to work and back to after school activity chaos. I know I am! I am also being smacked left right and centre in the head by the million and one balls I have thrown recklessly up into the air and making a spectacle of myself as I attempt to juggle. If like me, you have more luck finding the little contact triangles that are stuck to your bum and bottom of the shoes than finding the lunch order menu, term dates and class info you are actually after - you are going to love this. So you have probably heard me harping on and on, on Facebook about trying to get myself organised so my day runs smoothly, the house is in reasonable order and I can find what I want without resorting to ransacking the entire house and ULTIMATELY have more time (cause I am gonna be so super organised) to spend with my family and doing the things that I love to do. Well I have a few weapons up my sleeve and over the next few weeks I am gonna share some of the tips and tricks we use around this abode to make ourselves seem at least slightly like a functional family. So the first horse out of the gates is the organisation of all that paper work that comes home from school on a daily basis as well as the sports and activities info and timetables, bills, reminders and various other pieces of paper required to run a family. Blahhh *pant pant* that was quite a mouthful. The key for me is having a centralised area "Command Central" if you like, where everything is kept organised and within easy reach. This is very important if you don't want to pop a vein trying to explain to your hubby over the phone exactly WHERE he can find that important bit of information that you need RIGHT NOW!! I have this little area set up on the desk in my office and like with my newly organised pantry, I am a complete Nazi about everyone keeping it tidy and putting things back in their place when they have finished with it. This area has a jar of pens, notepads, diary and various files which I will show you in a sec, and they are all stored neatly in some fancy shmancy fabric magazine holders I picked up from Officeworks. So this all looks kinda normal and possibly even *gasp* basic, but I haven't shown you my secret weapon yet. Wanna see it? Ha I don't even know why I am asking, cause unless you click away right NOW (please don't), I am going to show it to you anyway - cause I'm kind of bossy like that. See that my pretty freaks, it is the Fabulous Pretty Neat Freak Family Organiser and this is going to make your life so much better.... trust me .....I'm not a Doctor but I was a veterinary nurse once upon a time. This is THE most organised Family Organiser I have come across yet. It has a space for everything and can leap tall buildings in a single bound. Ok it can't really, but if it had a cape I bet it could. There is a section for Family, School and Kindy, a place for list lovers like me to make and store all your lists and a place to record practically everything and anything. It even has a party planning section! Oh man I could go on and on, but I wont because I am sure you will come up with a million ideas for yourself. In addition to this Family Organiser I also keep in my Command Central these three folders. In these I store bills I have to pay, Tax Receipts and a folder for things I need to follow up. They are all ready and close on hand so when I get a spare 5 minutes I can attack something from the follow up folder. Once I have paid a bill or have finished with a document, I file it away in one of two organised Lever Arch Folders I have set up. No excuses now for me to tear apart a drawer or ten looking for THAT piece of paper I need. Now my gorgeous friends at Pretty Neat are mums as well so they certainly know a thing or too about juggling all that paperwork and they want to help you guys regain a little sanity too. If you have hung around here long enough, you KNOW I love me a good giveaway, especially when it is as cool as this one here. 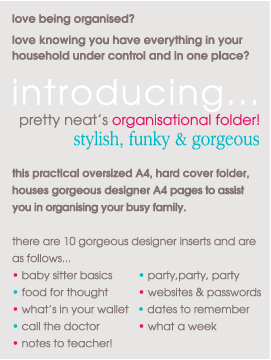 The beautiful gals at Pretty Neat - Paula and Angie *Hi Girls* are giving one lucky reader a Pretty Neat Freak Family Organiser all of your very own. Competition is open now and closes at 9pm 24/02/2012. If you don't want to wait and see if you win, you can go to the Pretty Neat Website and order one for yourself now. Go on - you won't regret it!